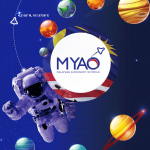 Furthermore, the main objective of MyESO is to cultivate the knowledge of Earth Science into students. It also aims to encourage students’ to further develop and explore their interest. Other than that, MyESO works within stages. It starts with a Preliminary Round and ends with a Final Round. In the final round, four students are selected to represent Malaysia to the International Earth Science Olympiad (IESO), www.ieso-info.org .